This is a sponsored article and was made possible by Recovery Toolbox. The actual contents and opinions are the sole views of the author who maintains editorial independence, even when a post is sponsored. Recovery Toolbox makes a ton of useful apps with a focus on, as the name implies, recovery. Whether its Microsoft Office apps, Lotus Notes, Photoshop, or any number of other apps, Recovery Toolbox can help you recover files. The company also makes password recovery and backup software. 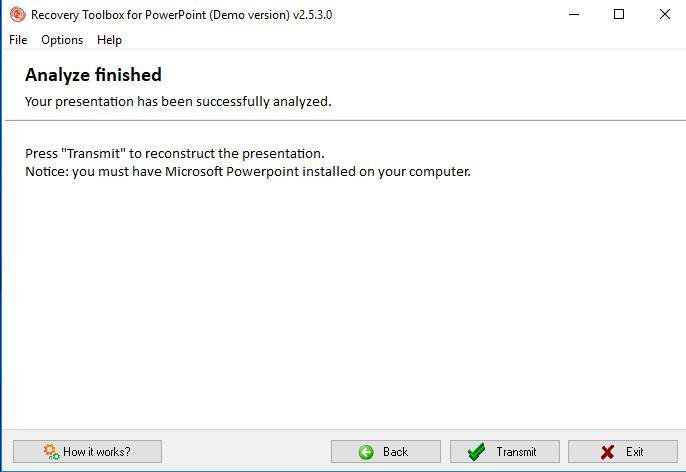 If you frequently use PowerPoint, it might be worth having the company’s Recovery Toolbox for PowerPoint installed. 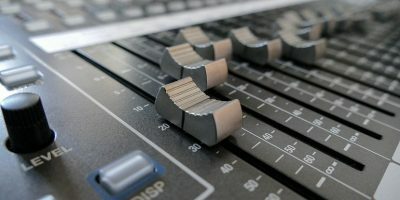 This is especially important if your PowerPoint files get passed around to people using different Office versions, as this can increase your risk of corrupted PowerPoint files. Considering its potential usefulness, Recovery Toolbox for PowerPoint is actually surprisingly affordable. The cheapest version is the Personal License, which is for personal non-commercial use and will cost you $27. 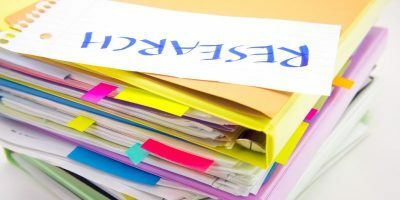 The Business License, which can be used commercially or in government institutions, doesn’t cost much more at $45. The site license, which lets you use the software on up to 100 computers, costs $60, which is still impressive. Finally, Recovery Toolbox for PowerPoint is available in a bundle that includes other products for recovering files in other Microsoft Office formats. These include Word, Excel, Access, and Project. This bundle costs $144 for the Personal License and $228 for the Business License. There’s one thing to keep in mind before buying this software. In order to use it, you’ll need to have PowerPoint installed on the same computer. This is likely a non-issue, since if you’re buying the software, you probably have PowerPoint installed already, but it’s worth keeping in mind. 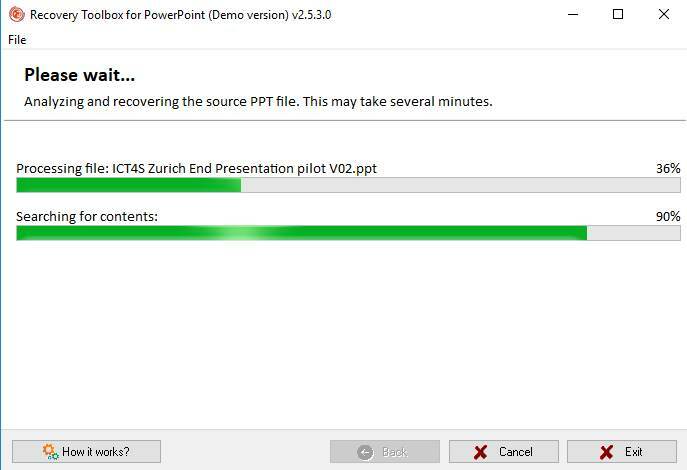 Since it is meant to do one thing and do it well, Recovery Toolbox for PowerPoint has its features honed to a fine point. You’re not going to find fancy UI options, but you will find an app that is focused on getting its job done well. Recovery Toolbox for PowerPoint supports both the .PPTX file format used by Microsoft Office 2007 and later as well as the .PPT version used by Office versions 97 through 2003. 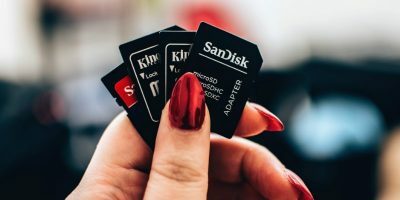 Not only does the program recover the PowerPoint files, but it will also save any media files it recognizes like images, videos, or sound files into a separate folder. It can also reconstruct any Microsoft Excel charts recovered from presentations. 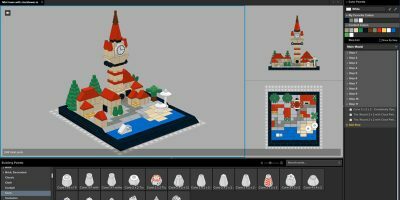 The app features an intelligent restoration engine to reconstruct PowerPoint files and uses artificial intelligence to restore older .PPT format files. The app works perfectly on Windows 10 but also works on older versions like Windows 8, Windows 7, and even all the way back to Windows 2000 and Windows XP. 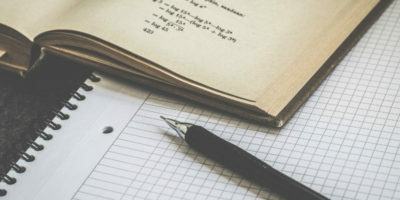 Though Recovery Toolbox for PowerPoint is far from expensive, you might still be reluctant to purchase the program if you’re unsure how many times you will use it. Maybe you just need to restore a file once but rarely ever use PowerPoint. In that case, you might want to use the online recovery tool the company provides. This tool has some limitations. It can’t recover password protected files, for one. Still, it may be handy if you almost never need to use PowerPoint files. You don’t even need to pay up front. Upload your file and go through the recovery process. Once this is complete, you’ll be able to see if the recovery was successful or not. If it is, you can pay to download the fixed file. The price may vary, but user reviews on the company’s website say the cost for them was around $10. Using Recovery Toolbox for PowerPoint is a fairly simple process and most of the work is done for you. Once you’ve downloaded and installed the app, launch it, and you’ll be prompted to select your file. 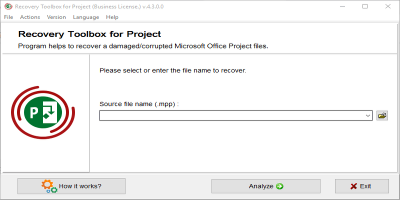 Hit “Next” and the program will begin analyzing your file and recovering it if possible. Depending on the size and complexity of the file, how long this takes will vary. In our testing the process never took more than a few minutes. 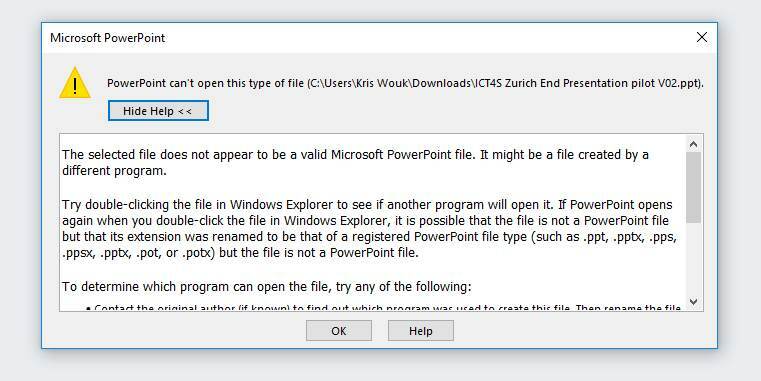 You can’t save the file once it has been successfully recovered, which is why you need PowerPoint installed. Hit the “Transmit” button, and the file will open in PowerPoint. Here you can look everything over and make sure the file has been properly recovered, then save it in the format of your choice. If any images are missing, you can check to see if they were placed in a separate folder, and add them back in manually. If you’re using the online version of the app, you can do this in your browser, then save the file. Note that online you can only save in the .PPTX format. 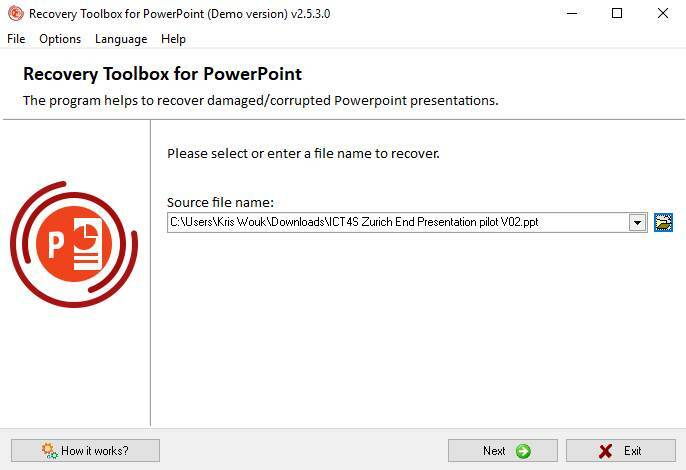 Recovery Toolbox for PowerPoint is a very specific tool, but from our testing, it seems very good at its job. Obviously, whether you need it will depend on how much you use PowerPoint. 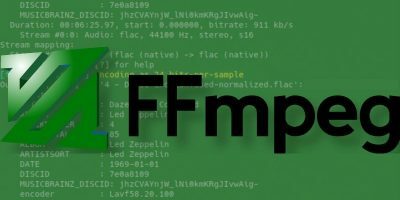 If you frequently find yourself in situations where a corrupted PowerPoint file can ruin your day, the software is well worth the modest price. 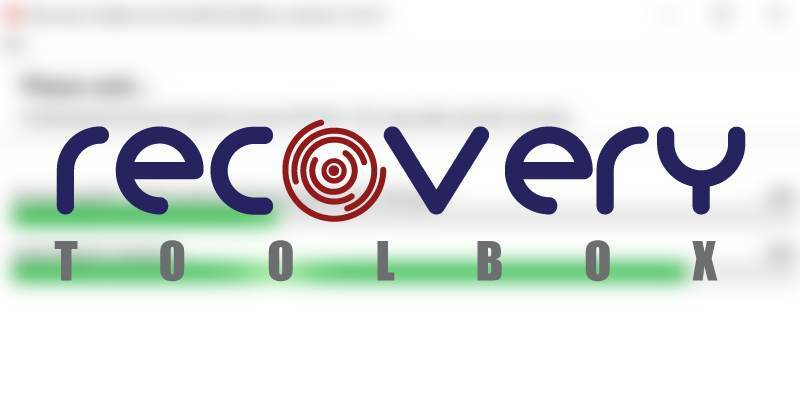 If you’re not sure whether to try it, you can download a demo version of Recovery Toolbox for PowerPoint and later buy it if you find it works for you.